In the winter of 2001, I had a bad case of bronchitis which turned into walking pneumonia. Up until then, I had spent my time searching for a book concept. No idea seemed good enough to fill a book. I tried to sleep, but all I would do is cough. I spent my days getting better by watching movies. It never crossed my mind that the idea would come to me while wrapped up in my blanket on the couch while extremely ill. The first movie was, As Good As it Gets, I was intrigued with the dialogue. The second movie was, City of Angels, I was intrigued by how the angels could read people’s minds. The last movie I watched was, Good Will Hunting, my favorite. I love the insight. During the park bench scene, Robin Williams’ character Sean has a monologue. Matt Damon’s character, Will, remains silent. It is after the monologue that Sean gets up and leaves Will in contemplation. Had Will been standing, he would have been left standing. So, what if at the end of every chapter, a character is left standing? 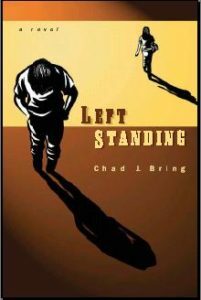 The idea for Left Standing was born. I wanted the book to be based in dialogue, but to have insight, and for the reader to be able to read more than one character’s mind. I first wrote the book in the form of a script containing only dialogue. Then, I added actions and internal thoughts. I wrote a majority of the book in three sections over the span of three years. Finally, after spending countless hours sending it to literary agents and traditional publishers, I became frustrated with the process. I found I had the time, but I was missing the right connections and luck. So, I decided to self-publish it through iUniverse as a way to get my ‘writing’ out there so traditional publishers can take notice. I sought an old friend from an ad agency, Dan Swoboda, to work with me on my book cover from concept to final version. I found these quotes that really pinpoint what I wanted to accomplish with this book.